Hi! I'm Jax from PA. I'm very new to nail art, but I've been doing the 31 day nail art challenge, which is almost complete, and I really have enjoyed it. My collection is pretty small comparatively to the amazing ones I see on some blogs. I keep around 50 polishes, 30 brushes, various dotters, acrylic paints, and random supplies, but that has been growing rapidly since I started the challenge. This Christmas, my mother-in-law bought me a gel kit and LED light, so I've been tinkering with gels since then, as well. My other interests include volunteering as a disability education advocate, with a focus on autism support education, and the training and rehabilitation of pit bulls and other bully breeds. I look forward to learning from all of you! A 31 day challenge!! I could never do that. That is sooo awesome. I can't wait to watch you grow. Yes, your collection will grow that I can promise you for sure. You won't even realize it. Haha. I haven't played with gels too much. For me, I like to do my nails every few days (if not more) and I think gels would be too much of a project to change that much. I applaud you for volunteering your time to some great causes! I think the gels have saved my nails during this challenge. I started the challenge with all intention of just learning a new artistic medium. Boy, did I underestimate! Daily doses (or more on days I had to redo and redo to get a satisfactory design) of pure acetone can wreak havoc on nails, cuticles, etc. I have become the cuticle crazy woman, keeping cuticle oil stashed within reach all over the house, lol. I only redid my gels twice during the month of the challenge, once right before, and once in the middle. Both times, I just did a simple French, but yes, it is a 2hr investment for me to sit and do the gels. It's not something I can rush through because if I do, then they won't last, and all that time is wasted. I was able to paint, remove the paint, paint again, day after day, while keeping the beds of my nails protected from all the polish changes. Tomorrow is my last day of the challenge. While I'll miss all the fun new things day after day, I think at least for a week or so, I'm going to enjoy just ONE mani. I looked at your blog after I made the post and WOW you have some nice designs in there!! I didn't realize you could do gels and change the art on them. Hhhhmmmmm I may have to look into that. I have to invest in some cuticle oil - I've just been using lotion and its not cutting it anymore. Cuticle oil is a godsend, but coconut oil works great, too (and is cheaper ounce for ounce). I use both. I use a variety of cuticle oils, ranging from super cheap to, well, not so cheap. LOL One I got free at Sally's when I bought my gel top coat there. The Sally Hansen ones were under $5 at Walgreens. The one I use the most is due to convenience. It has a roller ball and a screw cap. So I can take it everywhere with me and apply it in a snap. It's from Julep. 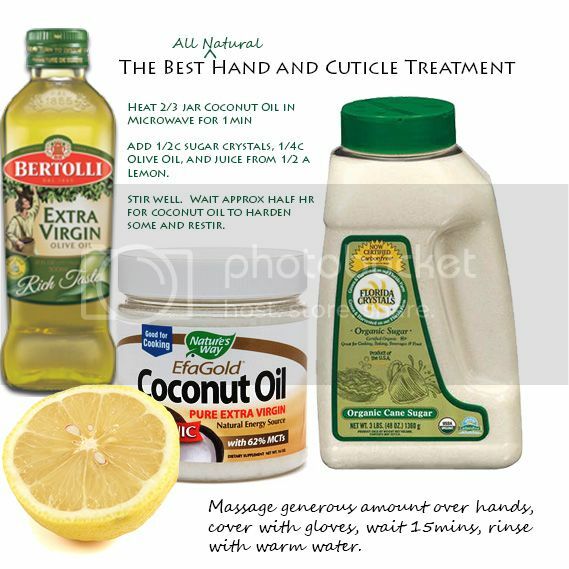 Here's the coconut oil setup I make for my hands. Since coconut oil is antifungal and antibacterial, I use it instead of soap when I wash my hands before and after a manicure. Keeps them from drying out. Buying everything you need to make this is about $20 but lasts a long time, and when cuticle oils and hand creams cost sooooo much per ounce, it's truly a great penny saver! The lemon is to fortify your skin with vitamin C and tones the skin. The sugar is to exfoliate. The olive oil is another great skin moisturizer that fends against sun damage and cancer and it's hypoallergenic. I have my nails done by a professional currently and I get gel also for the ability to leave a base color and add art on top. Easy removal of art with the base staying perfectly intact. I don't use gel on my guinea pigs though. I use regular acrylic paint and polish for them. I do more of my art on others than on myself. I have a hard time with my own right hand. Edited by Julie S, 04 February 2014 - 09:26 AM.